VCSE spent last week on the Isle of Wight and put the claim from Lonely Planet to the test that the island is the number one location in the world (note not just the UK) for cycling. IOW council were at the London Bike Show in January and we were able to grab a copy of the (free) cycling map which proved to be a bit more wieldy in the VCSE jersey pocket than taking the OS map on our rides. It’s pretty clear that the council have recognised the enormous potential to market the island for cycle holidays with the added attractions of a thriving music festival and local food scene likely to prove complimentary for two wheeled visitors. There’s a good choice of ferries across the Solent with Portsmouth the nearest terminal to Southend. There is a well signposted route around the island that can be ridden in either direction (clockwise or anti clockwise) but with other (quieter) roads shown on the map it’s pretty straightforward to work out a route. There are a number of dedicated cycle routes with more under development although these are mostly on the eastern side of the island and VCSE’s base in Freshwater Bay meant that we were exploring the roads around West Wight. For the same reason we can’t say too much about the suitability of theses routes for road bikes. 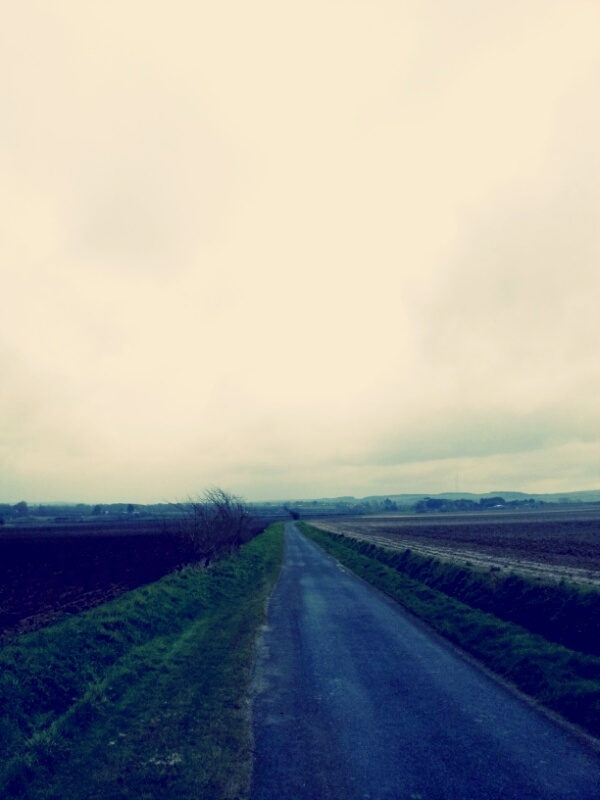 The one route we recce’d looked less suitable (between Freshwater and Yarmouth). The roads themselves while not exactly smooth are generally not too bad although there were a few sections that had broken up from frost. At this time of year even the main roads are pretty quiet and keeping to the round island routes and minor roads meant that we could ride two abreast 90% of the time. There’s some great scenery with Hobbit like ferns and moss covered banks enclosing some of the narrow lanes opening out to chalk downs near the south coast. Used to the wide open spaces of estuarial Essex the up and down nature of the IOW’s routes was a pleasant surprise and describing a course across the down land between Alum Bay and Ventnor you can find yourself on ramps of 12-14%. The downs peak around the 200′ mark but seem higher particulary when looking from north to south. There are plenty of short, punchy climbs around the 5 to 6% mark around the villages and farms VCSE visited. For an up and down ride with great views out to sea ride the Military Road from Freshwater towards Ventnor before it disappears; the road has been cut to one lane in places due to erosion. The downside of the rural riding is a fair amount of mud and farm ‘deposits’ on the road and the VCSE bikes looked more like cyclo crossers after our final ride. VCSE had some ‘moments’ on some of the descents on wet days. Less likely to be an issue as the weather warms up. It was unusual not to pass another rider of two when we were out despite the less than perfect weather. Winds were pretty light for our visit, a refreshing change from the Esplanade! 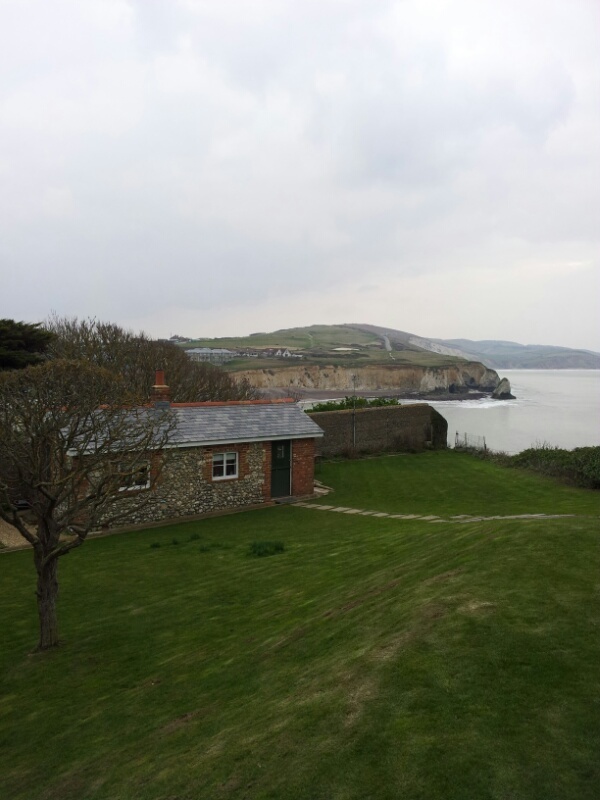 VCSE booked accomodation through Island Cottage Holidays (link below). They can also provide discounted ferry travel when you book your accomodation. Our base for the week was a reconstituted one bed cottage, part of a victorian coastal fort complete with moat and gun emplacements. Out of season its fair to say that sleepy does not really describe West Wight. We arrived on a Saturday and were a bit taken aback by the lack of people around. Outside of the convenience stores we didn’t see much else open. The handwritten sign in the antique clock store in Freshwater said that they would be closing for good on 6th April so perhaps the secret for commercial success is to try not to be too niche. If you do feel the need to shop then Ryde and the island capital Newport offer the most choice. For anyone needing cycling related retail therapy VCSE recommends a visit to The Bike Shed (link below). They have recently opened a new store in Ryde on Union Street and as well as stocking Trek have a well appointed service area. For those of a more off road persuasion The Bike Shed’s original store at Arreton (well sign posted) is a good starting point. Simon and the team are very friendly and are a good source of local info. VCSE is pleased to report that there is good eating on the island. IOW council produce some guides that are a good starting point to decide where to eat. Our pick from the week are The New Inn at Shalfleet and The Garlic Farm (links below). We managed to get a table at The New Inn on a Tuesday night in February but would probably advise booking a table otherwise. The food celebrates its local providence and there’s a good choice of meat and fish with vegetarians catered for also. The Garlic Farm is a great lunch stop (open daily until 5pm) and is a good spot to pick up foodie related gifts. VCSE enjoyed refuelling with thick cut ham, eggs and proper chips. 27 miles from one side to the other and approximately 70 miles around the ‘edge’ its possible to ride most of the best routes on the IOW in a week, if not more than once. VCSE intends to head back to the island later in the year but would recommend an out of season visit also.